As Muslims, we're often told that the fundamental difference between ours and that of more "regular" faiths is that Islam isn't merely a religion but a way of life. 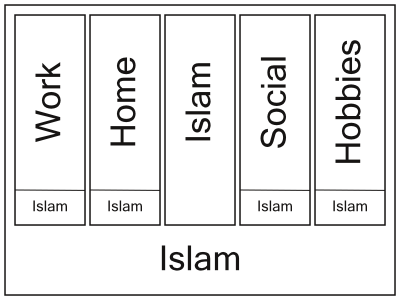 Personally I've never really understood in what particular way Islam is more life-encompassing than Christianity (say). In terms of being visibly led by scripture this can (and often is) demonstrated by other religions too; perhaps not as much but I'd say that's more to do with the relative age and exposure to secular influences than any fundamental differences. Generally the separation of religion and state is a subjective decision made in spite of religious teachings rather than because of it. 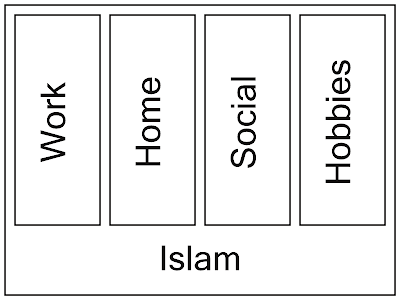 Regardless of whether Islam is unique or not in this way, I think it's worth discussing the ways in which Islam (or any religion) can be integrated into our lives. 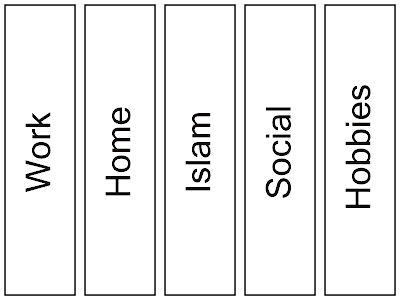 As with anything there are different depths and views on what integration actually entails, and I offer these not in any particular order of correctness or iman/faith (although possibly in terms of increasing complexity). Oh, and look: I even have pictures. 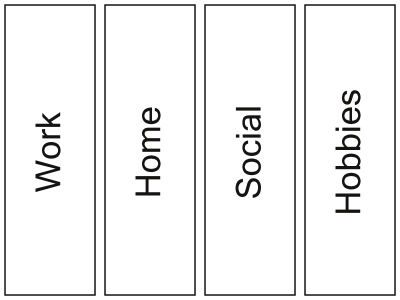 It's a massive simplification both in terms of number of boxes and how they relate to each other, but generally we're able to split our lives into boxes like those ones above. Someone with the above approach would pray and go to the mosque (perhaps regularly), fast during Ramadhan and the rest of it. However when making decisions about work or socialising they wouldn't really consider Islam or allow their practise of it to influence them - so they may miss a prayer if they're busy playing football or watching a film say. Religion is for a certain time and place, although since those times and places could be pretty often and big this isn't necessarily about side-lining Islam. For those in this group, they try to consciously adapt their lives and surroundings to what their understanding of Islam dictates. So they'll cancel a meeting at work if it means missing Asr, or delay going out till they're done praying. A social event means something visibly Islamic - a talk or Eid gathering say. They're always asking themselves "what would Islam want me to do", and try to answer that question based on knowledge and possibly general acceptability - so for example even if they don't smoke (and find it impermissible) they won't mind having a puff of shisha since their local alcohol-free (and so, halal) hang-out offers it. They're also a pretty visible bunch - they'll dress in a way which might uniquely identify them as Muslim and they'll continually mind their Islamic Ps and Qs and qualify all their interactions with fellow brothers and sisters with pre and post ASA/3As, jazaks and iAs and never forget to text all their Muslim pals with a Eid text on the two big days, and their hobbies almost exclusively include Islamic activities (or secular activities which have been "islamified") with almost exclusively Muslim friends, while their biggest factor in choosing a country to visit on holiday is whether or not they serve halal food or not. The biggest difference between these guys and that of the previous group is the level of explicitness of God awareness. In this sense any changes made to their lives due to Islam is latent and even subconscious; they don't explicitly ask themselves what's islamically right or wrong but already know based on some kind of internal abstract and finely honed compass guiding them. They won't subscribe to an islamic mortgage just because it's been rubber-stamped by a mufti, and although they'll enjoy the company of their Muslim community that would be just as much as other more secular activities. When they pray they don't necessarily make a point of it - for them it's a standard daily chore just like having three meals a day is and as such they won't allow scheduled prayer to stop them from living their lives but rather find a way to do both in conjunction (by simply and discreetly praying on the street for example). Reading in congregation isn't something restricted to fancy and special occasions but something quite normal and everyday. They may not offer you a literal peace greeting when seeing you but would offer you the stuff in their kind words and conversation anyway. And finally for them pervasiveness works both ways and where their Islam can influence their policies and opinions, they will also allow what would appear to be secular opinion and philosophy (presented by their non-Muslim friends) to influence their Islam, but only within the bounds they understand there to be. So perhaps at work Islam takes a more explicit and formal approach, while at home and with friends it's more pervasive and transparent. Nonetheless I think it's important for us to know exactly what kind of influence Islam has in our respective lives, perhaps to know whether or not we're practising in the way we wish to but more importantly so that we're aware of just how much the religion does dictate who and what we are in order for us to make any of the changes if it's not in the way we first thought it was. EDIT: Although I think most of the above is observation rather than advise, I'll qualify this with IANAS anyway. 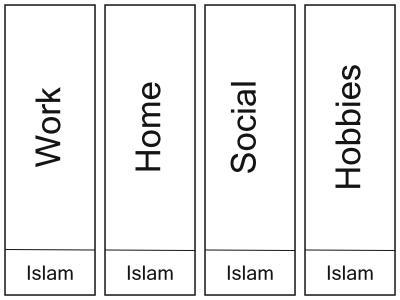 Good post Shak and I agree that we do need to ask ourselves 'What does Islam mean to me?' and more try to be consistent in the how we implement it within our lives. Looking at your illustrations I would say you could replace Islam with Religion or just 'Faith' as I think many god-conscious people of all religions may go through the same process of intrgrating their faith into their life. Though I do think that Muslims do seem to take it a little more seriously. I think this can be attributed to some basic things like the fact that we pray 5x a day, so if you are practising you have to take that into account, and again it's the same with Halal issues, from food to the type of entertainment events you may attend etc... it does affect some of the places you may choose not to go to for various reasons. Lots of faiths have similar prescriptions though, they just tend to be less adhered to by those who follow them. Perhaps then "way of life" just translates to "obligation", but I don't think it's that myself. I think that it's simply this: that you need to look at everything you do as a Muslim, or conversely that there isn't anything in this life that Islam doesn't have a direct or indirect opinion of. But still, even that could change over time. This is really good..especially the diagrams! Glad I found my way here. Explains the compartmentalisation thing really well.. The pictures took me as long as the article, so I'm glad you enjoyed them! slms. erm...feel a bit guilty now. Not sure how blog etiquette(sp?)works. Are you supposed to ask the author's permission before you share? Anyways posted this to FB and got postive feedback and a friend then sent it to her mailing list..so yeah. I guess you'll still get the hits to your site right? I can see these pics on a power point during an MSA youth session on 'where does Islam fit into our lives'..actually thats a good idea. Could we use the pics and acknowledge the author? Long answer: I think that there's an implicit understanding that blogs are in the public domain and are meant to be passed around etc via linking (as opposed to cutting and pasting etc). A heads up is nice but not necessary, and if anything it's flattering that you thought so much of it as to pass it on. Regarding use of the pics: that should be okay too provided you place a link back to the original article somewhere in the same presentation (that alone should cover any credit/acknowledgement due too). Let me know what you decide and even if you want the originals/DTP file; you can reach me via my Hotmail address.